On the western side of the Andes mountain range are a modern town and a river named Nazca, as well as the mysterious remains of an ancient civilization also identified as the Nazca (sometimes spelled Nasca). Remnants of the Nazca civilization include a strip of impressive buildings, but they are more famous for leaving their mark on the earth in a different way—with geoglyphs, which literally means markings on the earth ("geo" for earth; "glyph" for a symbolic figure or character). Throughout a 150-square-mile area in the foothills of the Andes, the Nazca made long, straight, single lines that eventually cross other straight lines to form geometrical figures, such as trapezoids, triangles, and rectangles. Other lines lead to images of a bird, a whale, assorted human figures, and even such everyday objects as an ancient loom. The Nazca Lines are located in an extremely arid area in Peru between the Andes mountain range and the Pacific Ocean. The territory lies between two rivers, the Nazca and the Grande, that border two valleys and an alluvial plain (a dry area composed of silt, sand, and gravel). Underground channels of water that surfaced to forms wells (puquios) were tapped by an ancient people long vanished by the time the lines were rediscovered in the 1920s. The extent of the Nazca Lines was not appreciated until the 1930s, when pilots of the first airplane flights in Peru reported a more extensive and varied collection of geogylphs than had previously been known. The geoglyphs were originally thought to mark channels for water, but the reports from pilots indicated the lines were much more complex. Torriba Mejìa, a Peruvian archaeologist, introduced results of the first modern scientific examination of the area to an international conference of archaeologists in Lima, Peru, in 1939. The layout of lines shows a sophistication with such geometrical figures as trapezoids—a rectangle where one end is larger than the other—triangles, and rectangles. Additionally, they lead to the more than 40 animal figures (including a monkey, a spider, a dog, a llama, and a bird with a tail 160 feet long) and some spiral patterns. The three most prominent explanations of the lines connect them either with the acquisition of water, with astronomical purposes, or with sacred rituals of the Nazca people. The connections between the Nazca Lines and the acquisition of water dates to the rediscovery of the lines in the 1920s, when scientists were studying ancient irrigation techniques. A local myth about a huge sand dune called Cerro Blanco, which supposedly conceals a vast lake that feeds underground water channels, or that once erupted and watered the region, reflects the local preoccupation with water. The "radiating centers" where many lines meet are located at bases of hills and at the elevated rim of a valley, where seasonal rivers run. Many lines parallel watercourses and often end abruptly, close to a river. A trapezoid appears at the edge of a river valley; the larger end of the trapezoid is located right near the edge where a seasonal river flows, perhaps serving as a marker. This connection between the lines and sources of water has been interpreted in terms of religion, when ancient ritual processions were made to places where water can be expected to accumulate. The Nazca people, according to the theory, walked along the lines leading to areas from which water came, where they may have paid tribute to their gods or chanted prayers to them to bring them water. The ancient Nazca people formed the lines by raking away the topsoil to uncover a lighter-colored clay, and they piled the topsoil along the sides of the yellow-white grooves. The results were grooves etched into the ground that remained lighter in color than the surrounding area. The densest concentration of Nazca Lines occurs in a place called Ingenio Valley, where seasonal rivers run from accumulated moisture in the Andes. The Ingenio Valley site became the focus for study by archaeologists, primarily to help trace irrigation routes to seasonal rivers. Remains were found of two primary settlements, Cahauchi and La Estaqueria. Cahauchi had a complex of buildings two miles long and about two-thirds of a mile wide that included pyramids reaching 70 feet high, village squares, and cemeteries. Based on carbon dating of pottery found at the site, the community thrived from about 100 to 600. Similar pottery found along lines leading to Cahauchi date as late as 800, suggesting the center may have been abandoned by 600 but still remained an important ceremonial site for a couple of centuries afterward. Radiocarbon dating shows that La Estaqueria was begun after Cahauchi was deserted. Historian Paul Kosok of Long Island University, New York, came to Nazca in 1941 to research the topic of irrigation among ancient civilizations. As he paused to rest on a hilltop, he noticed a line running directly to the setting Sun. The date was June 21, the day of the winter solstice in the southern hemisphere. The line marked the point on the horizon where the Sun set and the line leading in the opposite direction corresponded with the sunrise on that day. brought to the site by Kosok. She remained there for the next 50 years and made the study of the Nazca Lines her life work, represented in Contributions of Ancient Peru to the History of Geometry and Astronomy (1993). The theory that the Nazca Lines have astronomical purposes has been effectively challenged. In 1967, for example, Gerald Hawkins, an astronomer based at Boston University, used a computer to create a map of the sky over Nazca covering a 7,000-year period. The figures and lines on the ground were matched against actual settings of the solar system and constellations. Only 20 percent of the lines aligned with the rising and setting of the Sun and Moon for practical purposes, and there was no consistency between figures and constellations. Nevertheless, the lines that do match the rising and setting of the Sun suggest the lines could have served as a calendar. Being alerted about an upcoming season when the rivers were going to run, and when they would be dry, helped the community organize—knowing when to clear irrigation ditches, and when to plant seeds, for example. During the 1970s, archaeologist Helaine Silverman of the University of Texas theorized that the lines were marked out only after a period of drought. The gods had failed, or perhaps, as she contended, priests living at the ceremonial center in Cahauchi lost the veneration of the people when prolonged drought set in. If indeed the lines were formed after Cahauchi fell into decline, she argued, the lines represent the practical purpose of a community struggling to tap a basic necessity. and astronomy-related theories. Similar ancient lines found in present-day Bolivia, which borders Peru, were to be used in ritual processions. That rituals related to water took on spiritual dimensions in Nazca would hardly be surprising, for the area averages one-half inch of rainfall every two years. In addition to geoglyphs that seem to correspond to constellations, a number of the figures resemble water animals (a frog, a duck, a whale, for example), all of which are replicated on Nazca pottery. In addition to rain dances and rituals, the Nazca, like many other ancient societies, had a priestly caste that included shamans. Entering trances or performing rituals to get in touch with animal spirits is a common practice among shamans, and the bestiary images of the Nazca could reflect the animals they respected and the animal spirits a shaman would want to tap. 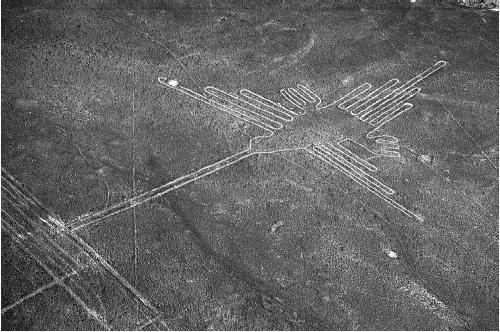 In October 2001, Colgate University professor Anthony Aveni said that his 30-year aerial and ground survey of the more than 800 Nazca Lines had led him to conclude that the unknown culture that made the strange markings had been practicing water magic. According to the results of his research, the approximately 62 points where the lines converge occur at bends and kinks in rivers or high places in the Andes from which water would flow. The lines were intended to be walked on, by the people while they prayed to the gods to make the land fertile. Faber, Lindsay. "The Nazca Lines—Professor Offers Theory on the Origins of Mysterious Mosaic." Greenwich Time, October 23, 2001. [Online] http://www.greenwichtime.com/news/greenwich/2001-10-23/article 1.shtml. this article is very interesting and it gives a lot of info about the lines! !